But can we help it really? The season is beginning, it is equal parts overwhelming and wonderful. 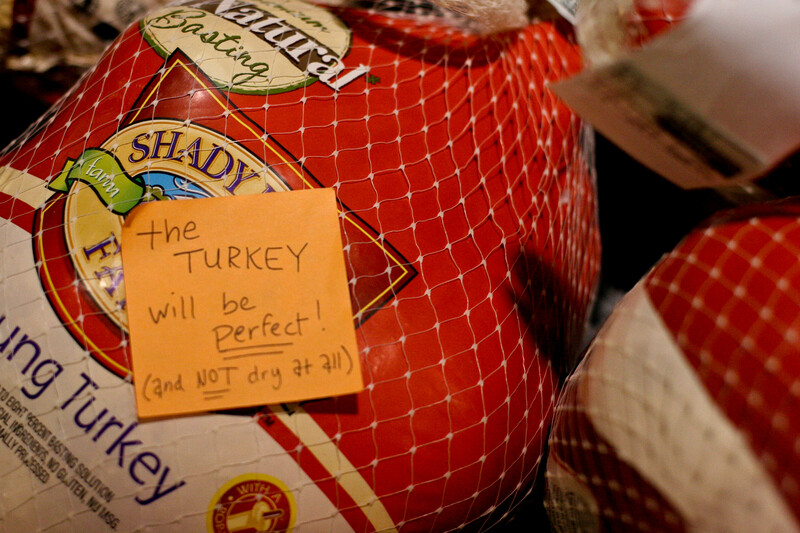 I have dear memories of cooking many a Thanksgiving turkey with my sisters and mom (we always named the bird) and at the same time being so very fried, me, not the turkey. We have so many expectations around the holidays and lots of family goodness and dysfunction, and a helluva lot of work. We want it to be special and meaningful (dare I say, magical?) and I can’t even imagine how the retail folk feel at the end…I wondered if there was a mission in the middle of all that somewhere…for everyone. 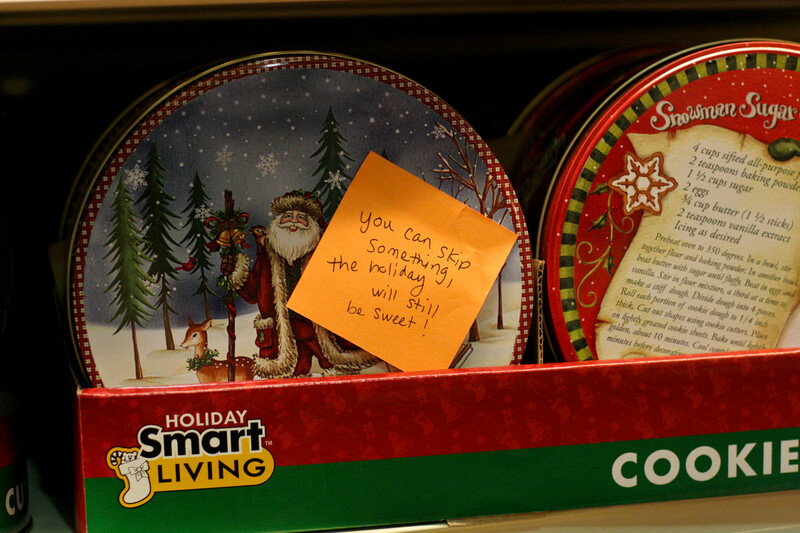 So Lyra and I went into our local grocery store and post-it/kindness bombed it…with all the things I could imagine that mothers, friends, stock boys/girls, the last minute Melvins may need to hear…or know. We thought you may like to join us. 1. Grab a pad of post-its. 2. 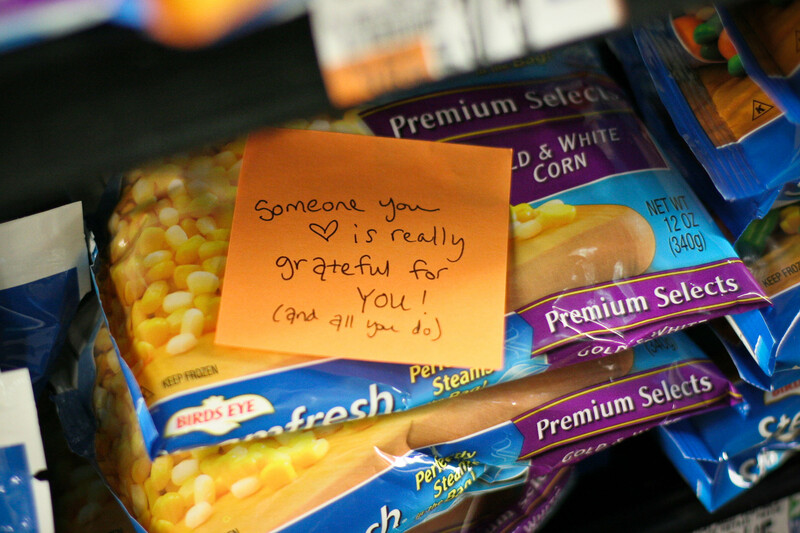 Write encouraging messages to harried mothers, tired checkout girls and strung out foodies…any kind message will do. You can skip something, the holiday will still be sweet. Your mashed potatoes are the best I’ve ever had, thanks for making them every year. 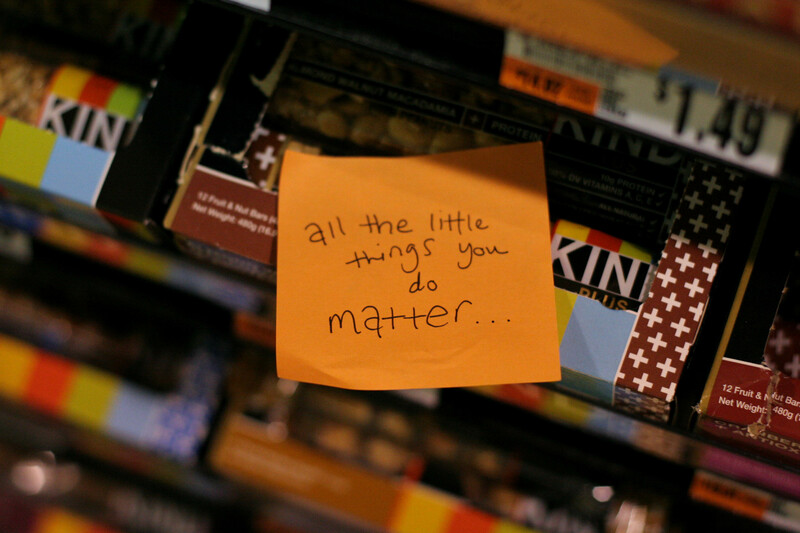 All the little things you do matter. It’s only one meal with your crazy family, you can do it. 3. Take the pad to your local grocery store and stealthily leave them all over the store- extra points for iphone pics. Or just tell us what city and store has been kindness bombed and we’ll mark it off the list. 4. You have from now until Thanksgiving day and send pics to patience@kindnessgirl.com or post them on our Guerrilla Goodness Facebook page. I can’t wait to see your holiday kindness in the midst of love and craziness and a mean green bean supreme! Please share this link on Facebook and let’s see how many stores we can hit!